This scarf is simply exquisite! Made with alternate rows of Memento ribbon yarn and East Track II ladder yarn, this beautiful, luxurious scarf caresses and sashays gently, and sparkles like little glittery crystals. Use corresponding colors of Memento and East Track II ladder yarn for a coordinated look, or use contrasting colors for a scarf that pops. Mix and match a plethora of colors to create incredible scarves and shawls. 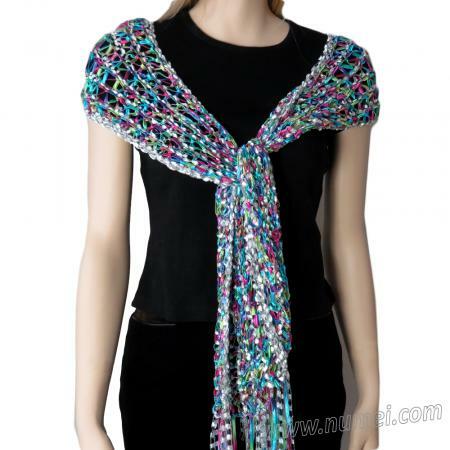 The White, Turquoise, Pink and Green Scarf is made using East Track II Col 102 and Memento Col 86. The Red Scarf is made using East Track II Col 124 and Memento Col 42. The Plum and Black Scarf is made using East Track II Col 134 and Memento Col 134. 1 x Berlini Memento (color of your choice):; May be substituted with Memento Royale. 1 x Berlini East Track II (color of your choice):; May be substituted with Berlini Ladder Ribbon Maxi. Do not cut yarn when it is time to change yarn. Carry unworked yarn loosely up along side of scarf. With East Track II, cast on 112 sts. R3: K1, *(YO, K1), rep * till end. Rep R1-4 for 5 more times. Bind off all stitches loosely.. Weave in all ends. Cut about 16 strands of each yarn about 12" long and attach to each end of scarf, alternating the 2 yarns between each strand. Copyright 2019 NuMei - This pattern may be used for non-commercial personal or guild use. Reproduction in print in any publication or electronic/digital format without permission is strictly prohibited. Every effort has been made to ensure that the directions contained in this pattern are accurate and complete; However, we cannot be responsible for individual variance, human or typographical errors.